Hi, Not seeing any errors here. Please turn on 'Debug Logging' and rerun the report. Then post the log for Device Watchdog. app:2192019-02-16 10:09:26.470 am warnstate.timeSinceMap: Switch - Table light hasn't checked in since 11h 9m ago. Switch - Lamp 1 hasn't checked in since 3h 22m ago. Switch - Maple hasn't checked in since 5h 5m ago. Switch - Lamp 2 hasn't checked in since 3h 22m ago. Switch - Picture frame hasn't checked in since 4h 9m ago. Switch - Heating blanket hasn't checked in since 9h 19m ago. Switch - Rockruff hasn't checked in since 11h 9m ago. Switch - Nightstand hasn't checked in since 9h 42m ago. Switch - Office lamp hasn't checked in since 20h 39m ago. Switch - Closet light hasn't checked in since 11h 21m ago. Switch - Stand 1 hasn't checked in since 9h 42m ago. Switch - Stand 2 hasn't checked in since 9h 42m ago. Switch - Pokemon hasn't checked in since 9h 48m ago. Switch - Bedroom Dimmer hasn't checked in since 9h 42m ago. Water Sensor - Furnace Moisture Sensor hasn't checked in since 3h 15m ago. 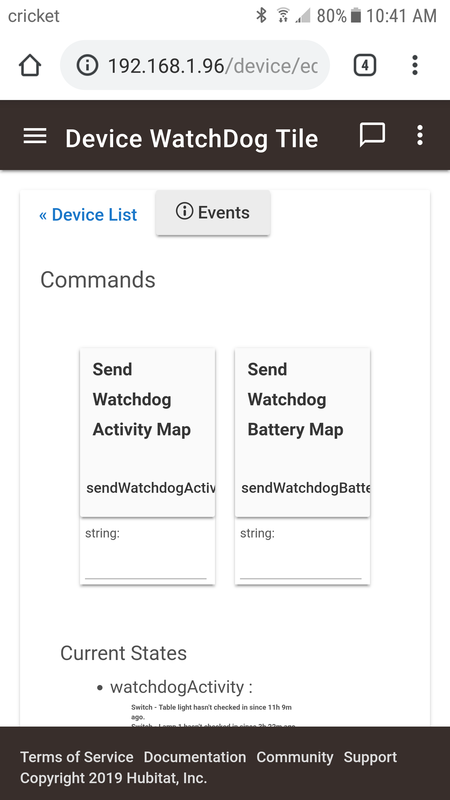 dev:2272019-02-16 10:09:26.448 am debugIn Device Watchdog Tile - Received new Activity data! app:2192019-02-16 10:09:26.423 am infoWater Sensor - Furnace Moisture Sensor hasn't checked in since 3h 15m ago. app:2192019-02-16 10:09:26.353 am infoSwitch - Bedroom Dimmer hasn't checked in since 9h 42m ago. app:2192019-02-16 10:09:26.335 am infoSwitch - Pokemon hasn't checked in since 9h 48m ago. app:2192019-02-16 10:09:26.317 am infoSwitch - Stand 2 hasn't checked in since 9h 42m ago. app:2192019-02-16 10:09:26.300 am infoSwitch - Stand 1 hasn't checked in since 9h 42m ago. app:2192019-02-16 10:09:26.271 am infoSwitch - Closet light hasn't checked in since 11h 21m ago. app:2192019-02-16 10:09:26.254 am infoSwitch - Office lamp hasn't checked in since 20h 39m ago. app:2192019-02-16 10:09:26.237 am infoSwitch - Nightstand hasn't checked in since 9h 42m ago. app:2192019-02-16 10:09:26.220 am infoSwitch - Rockruff hasn't checked in since 11h 9m ago. app:2192019-02-16 10:09:26.203 am infoSwitch - Heating blanket hasn't checked in since 9h 19m ago. app:2192019-02-16 10:09:26.186 am infoSwitch - Picture frame hasn't checked in since 4h 9m ago. app:2192019-02-16 10:09:26.168 am infoSwitch - Lamp 2 hasn't checked in since 3h 22m ago. app:2192019-02-16 10:09:26.151 am infoSwitch - Maple hasn't checked in since 5h 5m ago. app:2192019-02-16 10:09:26.134 am infoSwitch - Lamp 1 hasn't checked in since 3h 22m ago. app:2192019-02-16 10:09:26.100 am infoSwitch - Table light hasn't checked in since 11h 9m ago. If you click on dev:227 ... what does it show that it is associated with??? Please download child app v1.1.8 and see if the error goes away. I can not reproduce it so I'm just shooting in the dark right now. V1.1.8 - 02/16/19 - Trying to track down an error. It didn't go away after using your update. But what I did was delete the tile and made a new one. I also gave it a different name: Device WatchDog Tile 1. The error stopped after that. Well, no idea why you had that error but glad it's gone! Enjoy the app. I've just installed this app and it's really well done! The app doesn't store any information, each report is a brand new list. So there is no way to compare device state to previous list. V1.1.9 - 02/24/19 - Fixed Pushover reports. probably something I am not setting correctly but when I add the watchdog Activity tile to dashboards it works when I select "device status report" from the watchdog app it populates the dashboard tile correctly but if I refresh dashboard the info disappears/clears. With a watchdog battery tile the info stays when dashboard is refreshed. I have tried creating 2 separate virtual watchdog devices for each and the same results. I've tried to duplicate this behavior but can't seem to. I've tried to both reload the page and change pages and go back and everything is still there. Only one virtual device is needed. It'll hold both attributes. Change it back so both reports use the same device, then take a look at that device page and see if both attributes have data. Forget about the dashboard for now, just see if the data is in the device. I figured one virtual device would work but tried 2 as well. Anyway deleted the second virtual device and the one virtual device shows all the reports correctly even after refreshing. tried rebooting my hub as well and removing a bunch of devices from the dashboard in case it was a dashboard memory issue. 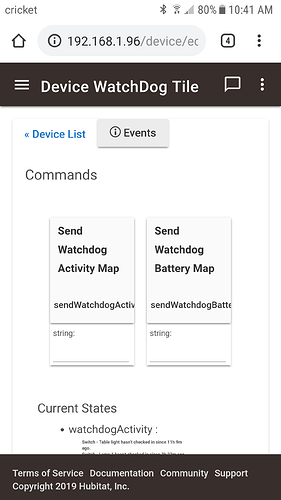 Tried deleting the watchdog activity routine and created a new new one with only a few devices. but still the same issue with the dashboard all Activity info gets wiped after refresh but the battery info is fine. one virtual device shows all the reports correctly even after refreshing. Okay, so everything with the app is working correctly. Something is going on with your dashboard then. Can you show a screenshot of your setup for the tile? Well I just went and created afresh new dashboard and everything is working fine on it. copied and pasted from old to new and back again to the old. maybe something got messed up when I originally created the watchdog Activity tile and was stuck in the dashboard memory. found the problem under the third tile setting watchdogActivity I originally had watchdogactivity with a lower case "a" instead of an uppercase "A"
info would originally push to the tile with the lower case "a" but then clear when I refreshed the dashboard. All working correctly with an upper case "A"
Great, glad to hear it's working. Thank you for the new version, I'll try it soon. For notification on return online, what about subscribe to device activity (if it's possible), sending notification (removing subscription) when it's back? Another suggestion: looking at app variables, in mySensors are stored the entire sensor objects (with all their properties, it's very huge on mine), maybe it could be better to pass the object to myBatteryHandler() and mySensorHandler() without write it into Hubitat? Sorry, you completely lost me on that one.